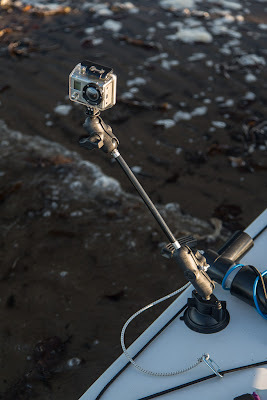 Sea kayaking with seakayakphoto.com: Kayalu GoPro mount and extension review. Kayalu GoPro mount and extension review. I occasionally take a GoPro camera mounted on the kayak. The standard GoPro mounts are a bit restrictive so this was a home made mount with an aluminium pole fixed to the GoPro motorsport surface suction mount. It was not strong enough without the stays. It was all a bit of a faff and so I have only used it a couple of times. I have previously reported on the Kayalu Kayalite with which I have been completely satisfied, so I decided to order the succinctly but accurately named Kayalu RAM Mounts Locking Suction GoPro® Hero Camera Mount with Toughbar® Extension Arm! The RAM suction mount is much stronger and more corrosion resistant than the GoPro version. The extension consists of a wonderfully simple rod and four ball joints which are linked in pairs by simple locking couplers which have easy to operate thumb screws. It is a brilliant solution for quickly adjusting the position and angle of the camera. Compared to this the GoPro mounts and connector pieces are over complex and restrictive and the screws and bolts rust. The Kayalu kit is all made from corrosion resistant stainless steel, aluminium and fibreglass composite (unlike the plated steel and weaker moulded plastic of the GoPro mounts). It comes with a safety leash and snap link. 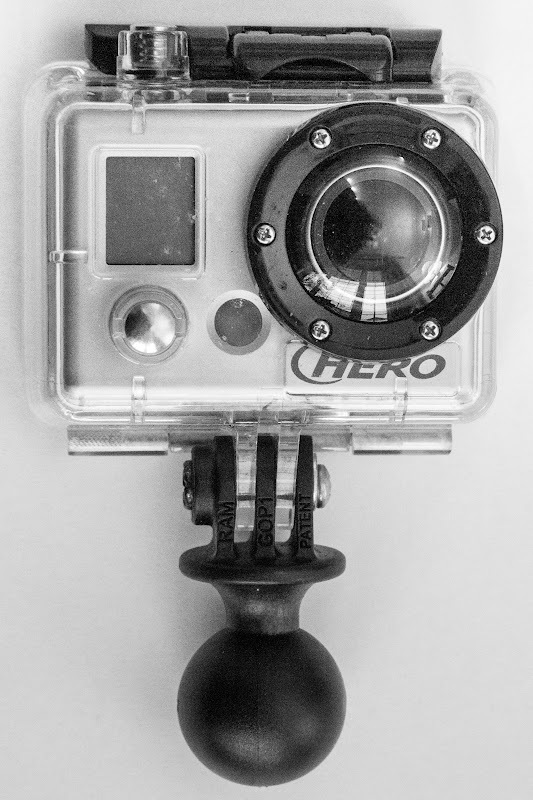 The top ball joint connects directly to the clear plastic GoPro case in place of the standard GoPro mount. The ball joints are the secret of the quick easy adjustment. The Ram mount suction cup can be mounted anywhere the kayak hull or deck is reasonably flat. It will even stick to the hull on the waterline for unusual angle shots. It is best to mount it on a surface that is not too flexible as it can "bounce". I found near a bulkhead, a deck moulding or where the kayak tapers near the bow or stern to be rigid enough. So does it work? 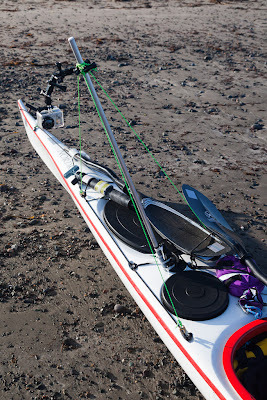 Well I think the the kayalu mount (with optional 10" extension bar) is ideal for kayak photography using the GoPro wide angle lens and gives a far wider range of mounting viewpoints on a kayak compared with the standard GoPro mounts. The suction cup mount survived everything a rough Scottish winter day could throw at it. 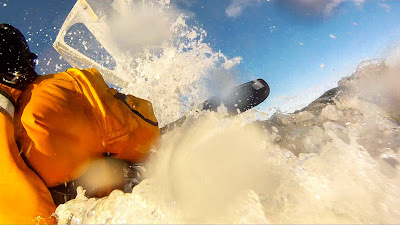 It did get knocked off at one point when we rafted up in a big swell but the safety leash worked! 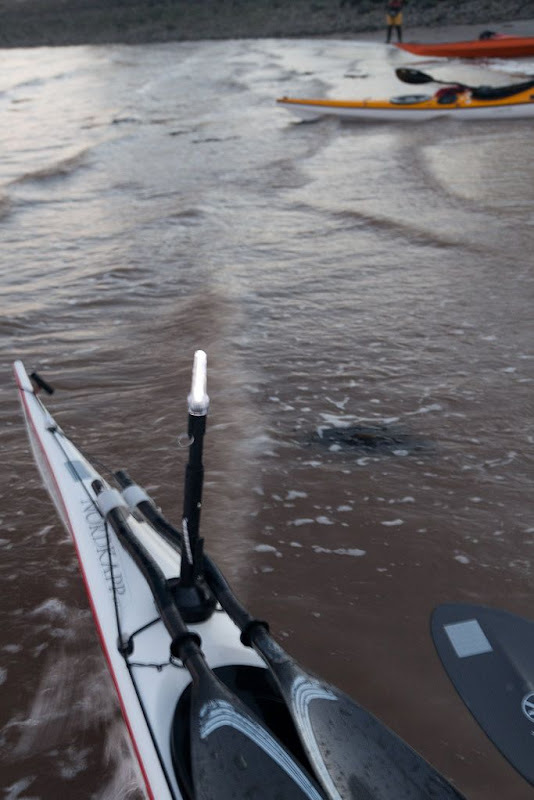 I mounted it close enough to reach the on/off switch but it would be better mounted further back so that the svelte kayaker took up less of the frame. I look forward to trying it nearer the bow and stern with the new GoPro WiFi remote control. All in all I am highly impressed by the Kayalu GoPro mount and extension and if I had been able to buy it from a retail outlet in the UK I would have awarded it 10/10. I could not find a UK distributor, so I ordered mine direct from the Kayula, the manufacturer in the USA. The cost was $69.95 + $30 shipping. I paid £63.92 via PayPal then had to pay £13.60 UK import duty and a Parcelforce administration fee (for handling the import tax) of £8 bringing the total to £85.52. I suspect I have had to pay both USA and UK sales taxes and the cost of international delivery and the handling fee for collecting the UK import tax makes it quite expensive. It was a price I was prepared to pay for such a well designed device manufactured from quality material. It is superior in every way to the standard GoPro mounts and also my home made/GoPro mount. Please see http://www.leonardoesch.blogspot.com.br/2012/12/remada-farroupilha.html - sorry, only in portuguese, but can be translated online. Greetings Leonardo, please call me just Douglas! Thanks for the link to your post. What a great lunch spot! I think your mount (further back) gives a better result than mine. And nearly 5 years on, just wondering if your impresions are still the same? Hello Mike I am still using this mount 5 years on. I managed to break one of the clamps which grips the ball ends when using the long extension and something bumped into it. The clamps are actually made by RAM Mount and I was able to get a much cheaper replacement in the UK from them than if I had to import from Kayalu in the USA. Some recent photos are here.